Lured by warm waters, a pod of killer whales became trapped in the ice near a remote Canadian fishing village when the waters froze overnight. ABC News reports the villagers found about a dozen orcas desperately trying to stay alive by taking turns breathing out of a hole in the ice that was no bigger than a pickup truck. Killer whales are some of the smartest in the sea, but it was the unusually warm winter weather that drew the pod into the Hudson Bay in search of food. At most, an orca can go 20 minutes with one breath - but that oxygen will only get them about a mile's swim. With no food and not enough breathing spots to lead them out of the frozen bay, the orcas time was running short. "It appears from time to time that they panic. Other times they are gone for a long time, probably looking for another open space, which they are not able to find." Mayor Peter Inukpuk told the BBC. But as quick as the icy air came in and froze the bay, the winds shifted and created a six-mile passageway that lead the orcas back out to open water. 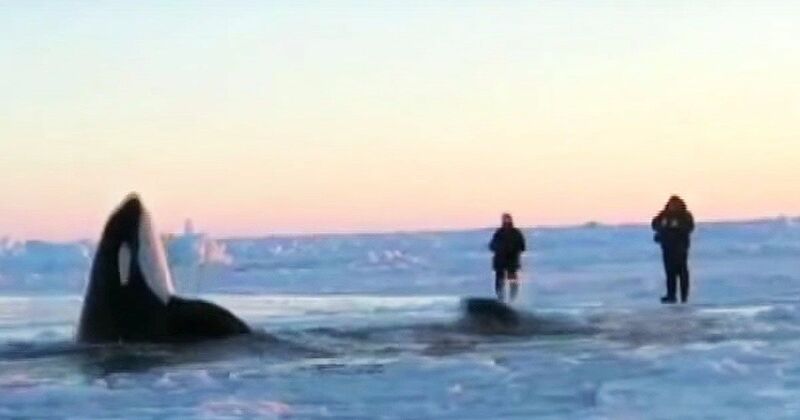 "This is great news," town manager Johnny Williams told ABC, "Two men were sent to check on the whales ... and they found that a passage of water had been created, all of the way to the open sea." Williams told ABC the villagers celebrated the orca's escape after days worrying about their fate. The villagers had contacted the government to help the stranded animals, but officials were afraid an icebreaker would scare them off, and a helicopter rescue was too expensive and risky. Check out the incredible, and emotional footage below of the killer whales desperately trying to stay alive in the frozen bay.